I’ve always had a dark turn of mind. This, coupled with a love of interesting technical facts, combines to form an abiding interest in nuclear bombs. The literature was still there for me to discover though, and a lot of my favourite stories were set in a post-apocalyptic world. Louise Lawrence’s Children of the Dust, John Christopher’s ‘Tripods’ series, and Caroline MacDonald’s The Lake at the End of the World were all read repeatedly. Later, John Hersey’s Hiroshima gave me the horrific detail that the children’s books had only alluded to. Anyway, the following map is a better effort at some figures I scribbled down some years ago. 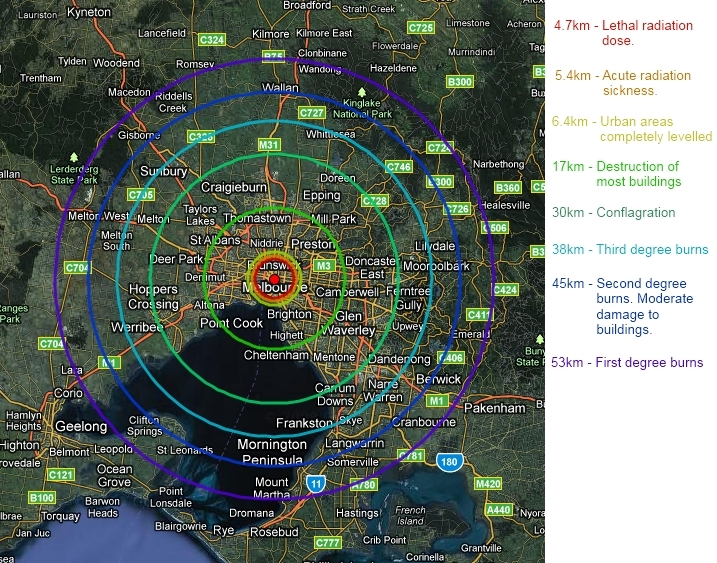 A good map can illuminate many things, and hopefully this one shows just how big the explosion of a big nuclear bomb is. A good shorthand for measuring the explosive power of large explosions such as a nuclear bomb is in tonnes of TNT. The ‘Little Boy’ bomb dropped on Hiroshima exploded with a force of 15 kilotonnes, or 15,000 tonnes of TNT. The largest ever nuclear bomb, the USSR’s 1961 effort ‘Tsar Bomba,’ was originally going to detonate with a force of 100 megatonnes, but was scaled back at the last moment to 50 megatonnes (50 million tonnes of TNT) – pussies. If you're 5.4km from the blast (within the radius at which urban areas are destroyed) but happen not to be in a building does this mean that you would survive the initial blast, but dies days later of radiation sickness? Wouldn't the blast, which can level buildings, also pulverise people? Yes dear, the massive shockwave that completely levels urban areas would also level you. You'd also be within the 30km 'conflagration' radius. I imagine it would basically be like the guy hanging off the chain-link fence in Terminator 2. Acute radiation sickness would be the least of your worries.